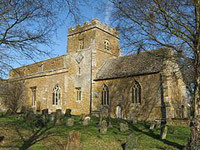 For a small village, set in North Oxfordshire, St Etheldreda’s Church is an imposing monument. Its origins date from the 12th century of which only the Tower and Chancel remain. The nave was rebuilt in the 13th century with further restorations in 15th or 16th centuries. The original ring of 4 bells dating from 1706 has been recently supplemented by a further 2 in 2013. 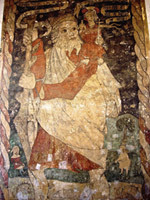 Of notable interest is a large wall painting of St. Christopher, mentioned by Simon Jenkins in his “1000 best churches”, which shows representation of fishing with rod and line and a conversation between the giant and the Christ-Child borne on his shoulder. It dates from mid to late 15th century. There is a Chamber Organ (still in regular use) with a carved wooden case and a decorated front. In this respect the church has a justified reputation with an excellent acoustic. The pews were all removed in the early 20th century, and have been more recently replaced by sturdy, comfortable chairs, all of which makes St. Etheldreda’s Church an excellent concert venue! It has become our custom to perform a Missa Brevis liturgically; this year Mozart’s Missa Brevis in B flat K275 will be played.